Australian top gun Matt Hall has grabbed a share of the world championship lead after a stunning third place in the third round of the Red Bull Air Race in Rovinj, Croatia. Hall came through a roller-coaster day with his third consecutive podium finish to move to 25 points and a place atop the overall standings with two-time world champion Paul Bonhomme of Britain. It was the first time in his four-year Red Bull Air Race career that Hall has had three consecutive podium results or sat at the top of the series ladder. 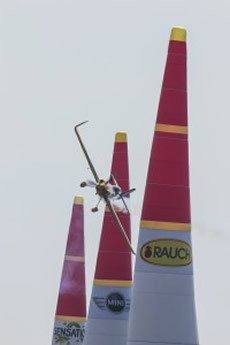 Austria’s Hannes Arch (54.012) won the day from Czech pilot Martin Sonka (54.083) and Hall’s 54.160. American veteran Michael Goulian was fourth. Arch, another former world champion, moved into third in the overall championship, eight points behind Hall. The result was a far cry from how the day had begun for the Australian who had qualified in third place and been a standout performer in the event’s training sessions. Hall (54.818) started the day by losing to Britain’s reigning world champion Nigel Lamb (54.702) in their round of 14 heat by a mere 0.116. After a nervous wait the former RAAF Wing Commander progressed through to the round of 8 by virtue of being the ‘lucky loser’ – the fastest of the seven pilots defeated in their heat. Hall’s crack at the top 8 placings was justified as he had the fourth quickest time of the round but as the ‘lucky loser’ he had the misfortune of coming up against Bonhomme in the head-to-head elimination quarter-final. With his race on the line the 43-year-old from Merewether in NSW laid down the flight of his life to clock 53.166 for the fastest time of the day, forcing Bonhomme to fly to his absolute limits. Two thirds of the way through his run the Brit looked to have Hall on the brink of elimination for the second time in two hours, only to bust through the race’s 10G limit, causing an instant Did Not Finish ruling. Hall then entered the final four as a hot favourite but Arch and Sonka were too good, the Australian again falling just short of a maiden Red Bull Air Race victory. “That close again, huh,” Hall said. Hall paid tribute to his team and said they remained focussed on the overall goal of a top finish in the end of season world championship standings. “We’ve had a few things not go our way in the last three races, just things that happen from time to time to all teams but my team has always managed to bounce back and be really strong and positive on race day,” Hall said. The next round of the Red Bull Air Race World Championships will take place in Budapest on the first weekend in July before further stops in Ascot (UK), Spielberg, Dallas/Fort Worth and Las Vegas.